Though I have been illustrating children’s books for 15 years, I did not write a story of my own. A few people, including some of my editors, encouraged me to create my own stories for children. The thought of making my own story has been with me since then. When I illustrated other people’s stories, I tried to interpret their visions. I had dreamed that I would be able to make my own stories so that I may share my passions and my personal experiences thus impacting the young audiences. Over the years, I came to the conclusion that I would like to write something about my own Chinese experiences, loves, values and the culture that I’d like to be able to pass onto coming generations. My mission is to create beautiful illustrations that represent the universal themes of love and human connectivity in order to promote understanding between different cultures. China and the Chinese culture have long been a mystery to the people of the west. This has created a stronger and stronger natural curiosity about the real Chinese people, their culture, their traditions, their lives, and their stories. According to the 2000 U.S. census, over 2.4 million Chinese Americans live in the United States. 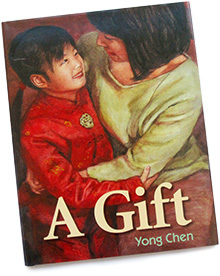 Even as the non-Chinese Americans want to understand the Chinese culture, Chinese Americans would like to have their children understand their own heritage through heart-warming stories and illustrations. Love and human connectivity are common to all cultures. While there are many styles and types of stories in the children’s book market, I am confident that there will never be enough good children’s books about love and human connectivity. With my Chinese cultural background, I can bring a deeper understanding of eastern and western culture to the stories. Though I have left China for 20 years, and China has been changed so much since then, I still often went back to my old memory to find my comfort. The old big banyan and the stone bridge outside of my old village and the early morning reading under the oil-burning lump… brought me back home in my dreams. Finally, two years ago, our family took a trip to China to visit our families and friends. This has added many more vivid memories. It had pulled me closer to the roots of my homeland. The time we spent with an uncle in a country farming field left me with the smell of the fresh plowed earth in my memory; and the day we stayed at another uncle’s big fishpond, fishing from the deck and riding on his boat, I clearly remembered the laughter and conversations, all of which had re-connected me with our natural and loving culture. At the beginning of this program, I decided to fulfill my dream of writing a story derived from my own culture and experience. I wanted a story that would include the people I know and love living in China, the village where I grew up, and how they still connected with my own family in the United States. How do I create a story about the farming uncle, the fish-farmer and the uncle who works in a hospital, plus a young family who lives in the United States? There is one thing missing — a symbolic link that will connect all these people together, deliver the message and embed the Chinese culture into the story. Something simple, something unique, something that represents love, something that represents the home, something very cultural. Then I imagined, what would happen if, one day a package arrived with a simple stone uncovered from the earth by our farmer uncle. This stone had gone on a journey through China from uncle to uncle, and the stone turned into a beautiful dragon-necklace, and was now with us in America. I now had my story. Two months later, when I presented the dummy-book to the art director and editor in Boyds Mills Press, they wanted to publish it. Three months later, I completed all the paintings. I named it “A Gift”. Watch the interview by a Chinese TV network.